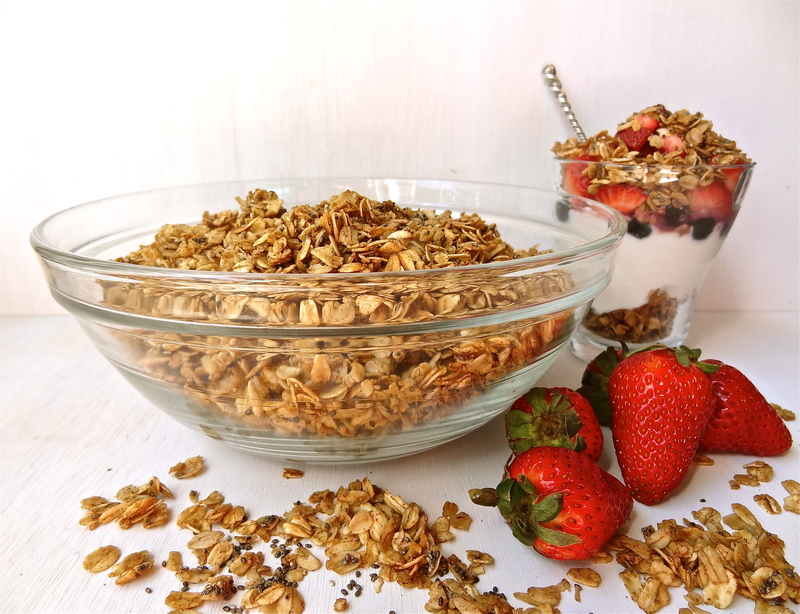 Cinnamon Chia Seed Granola | What about this? I keep a little jar of chia seeds on my kitchen table to remind me to sprinkle the seeds on my food at mealtime, but I’m always looking for additional ways to incorporate it into my diet. This recipe for Cinnamon Chia Seed Granola couldn’t be easier and it is packed with good things – cinnamon, chia seeds, rolled oats, and honey. It’s great for breakfast or for a snack! Need more super ways to eat this superfood? Here’s a link to 40 Ways to Use Chia Seeds. Preheat oven to 300 degrees and spray a cookie sheet with cooking spray. Combine the first four ingredients in a small bowl and stir. Slowly stir honey and canola oil into oat mixture until oats are adequately coated. Spread granola onto prepared cookie sheet and bake for approximately 15 minutes, stirring halfway through. Let cool until oats become crunchy and enjoy. 1. I quadrupled the recipe because I wanted extra for snacking! 2. Because I quadrupled the recipe, I baked it longer. It took about 15-20 minutes of additional baking time to get my batch of granola golden and crunchy. 3. If you measure out the oil before the honey, the honey will slide right off of the oiled tablespoon!